Since retail markdowns seem to be coming earlier each year (this year Black Friday was meaningless as discounts started in early November), I like to play a little game I created when I'm out there in the stores called "Why is this item on the sale rack?" 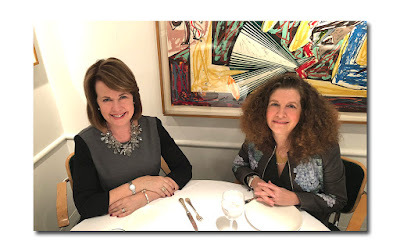 Sometimes one can attribute a languishing garment to an unflattering cut, a hard-to-wear color, a strange proportion or even a glut of similar product. Perhaps the original selling price was so stratospheric that even the markdown is an affront to the wallet. Occasionally ( best case scenario), the item is just a tad ahead of its time, so many have passed it over not having the prescience to realize its fierceness. These observations are all valid however I don't believe that any of the above is the main reason for most price slashing. Top answer on the board? My own personal survey says it's FABRIC! If a fabric feels itchy, stiff, or uncomfortable to the touch or looks tacky, I'm sure as hell not going to try it on, let alone buy it. I assume I'm not alone here. 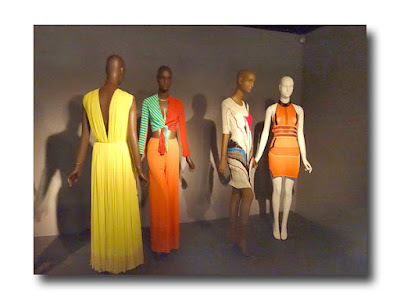 Fabric is to fashion what location is to real estate -- if you don't have it right nothing else really matters. "Fabric in Fashion" at the Museum at FIT (now through May 4, 2019) serves to educate us about how textiles, once recognized and sought after by all pre-20th century stylish Western women, have gone beyond the changing whims of fashion, often driving the social and economic history of the world. 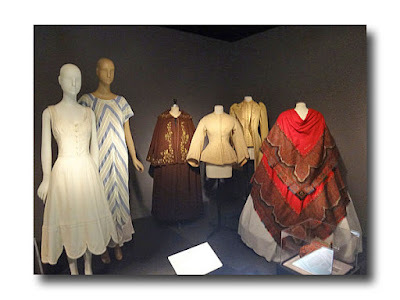 Curator Elizabeth Way decided to do this exhibition because she has always liked textiles and wants to educate FIT students to be familiar with the difference between silk and satin. Way patiently explained to me that silk is a fiber while satin is a weave and a type of fabric which could be made from either silk or a synthetic. 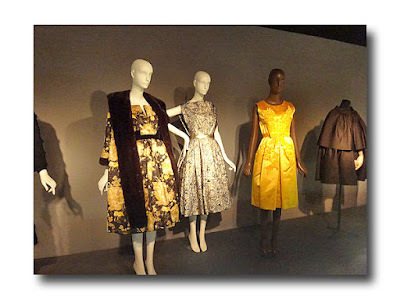 There are several examples throughout the exhibition showing how the use of the same material with a different weave will result in very different fabrications. For instance, a taffeta, faille or ottoman could all be made of silk, but as the scale of yarn changes, the rib becomes more pronounced. The exhibition begins with a classic silhouette of a mid-18th-century court gown on which various textile motifs from the last three centuries (including a leopard print!) 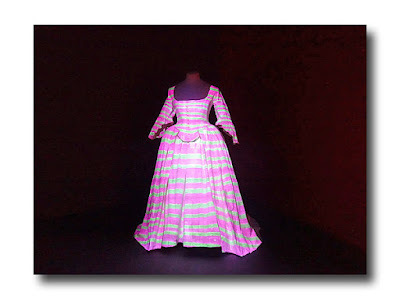 are projected onto the toile. This perfectly illustrates the point that the same dress looks completely different just by changing the fabric. 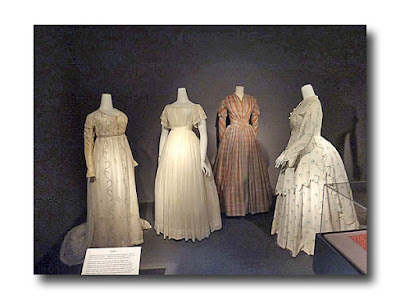 The exhibition focuses on giving a brief history of silk, cotton, wool, and synthetics while also showing the physical properties of each fabric and how they interact --clinging to or floating away from the body as displayed in garments through history. Silk, originating in China was in demand for the French textile industry centered in Lyon as early as the 15th century. Lyon later helped Paris become the fashion capital by supplying 19th and 20th-century couture houses with trendsetting materials. Beginning in the mid-1800's Asian inspired brocades and damasks (from Damascus, today's Syria, hence the name) were imported to Europe via what became known as the Silk Road. Silk was worn by noble men and women until the 19th century when it became feminized as well as more accessible to the middle class. At this point, Western men discovered wool which could be tailored and worn with bright, white cotton shirts. Wool tailoring for women was slower to catch on not coming into play until the 19th century Industrial Revolution when freedom of movement was important -- previously worn bulky wool capes were less practical. Beginning in the Middle Ages wool was instrumental in financing the growth of the British economy. During the 18th century, England embraced cotton imported from India which was a costly luxury fabric at first. 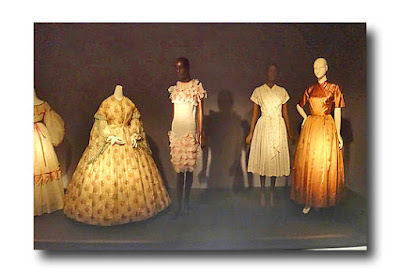 By the late 19th century cotton became democratized and accessible. "The fabric of our lives" came to America albeit not without strings attached with its ties into the Civil War and slave labor. 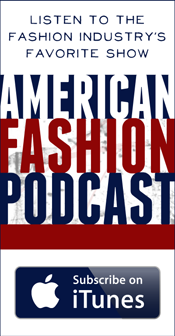 Cotton was worn casually in a quintessentially American fashion setting us apart from Europe. With the dawn of the Industrial Revolution, textiles became much more affordable and available now that they could be woven by machine rather than by hand. Techniques including embroidery and fringe could be mixed into the weave rather than appliqued afterward. Velvets (one of my favorite fabrics) became popular in response to modernization as people were looking for something tactile, soft and comforting. 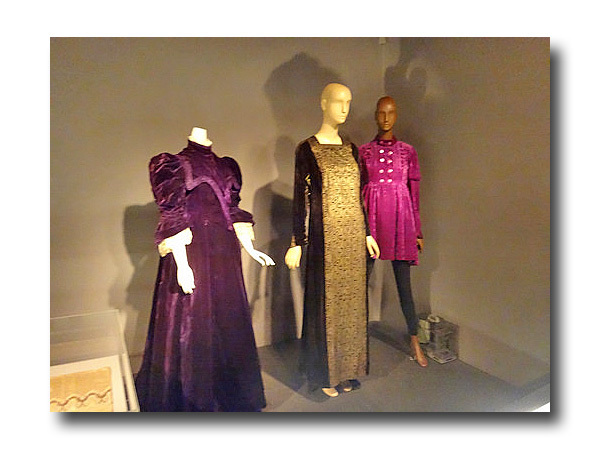 Curator Way pointed out that we still associate velvet with this time historically -- there are some excellent examples of "regal" or "medieval" looking velvets on display here particularly the purple rayon velvet coat with embossed moiré design (1968). Synthetics came about as nineteenth-century scientists created new fibers from petroleum by-products as well as nylon and polyester. 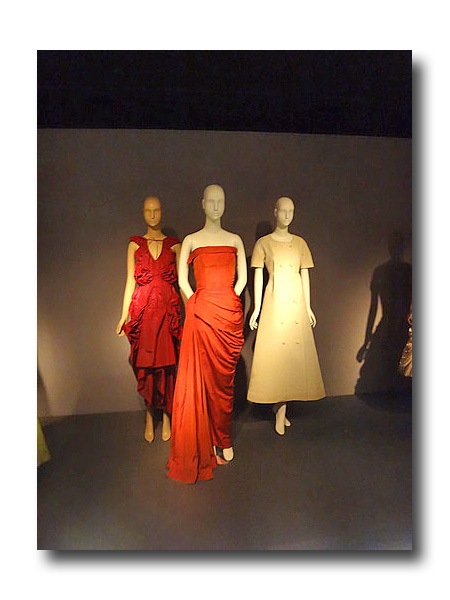 Rayon, a man-made silk substitute was introduced around 1930. Jersey woven knits which had only been used previously for stockings, or men's underwear and socks became a desired ready-to-wear fabric in the 1920s. 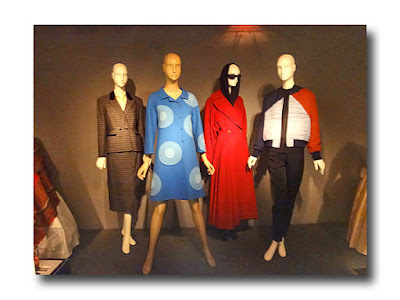 On display here are an Andre Courreges vinyl coat trimmed in white faux fur, a Halston Ultrasuede garment, a Romeo Gigli faux smocked velvet coat made with a polyurethane ink -- a much faster process than the handmade embossing technique, and an Issey Miyake synthetic metallic ruffled cape ensemble. There is plenty of information to garner walking through this exhibition. Fun fact: did you know that the word "paisley" actually refers to the large town in Scotland where the textile pattern was created? Labels: New York Fashion Cool-Aid by Laurel Marcus: "Museum at FIT Fabric in Fashion has Material Evidence"